So let’s paint a picture. You are hosting a baby shower for your best friend. You are honored to be asked and intend to make it the perfect day. You know your friend’s taste. She is having a girl, but she doesn’t want frilly pink decorations and cheesy shower games. You plan a classy afternoon, but when you arrive at the venue to set up, the room you expect to be in has been double booked. They put you in a smaller room near the pool which is loud with children splashing and yelling. The mother-in-law arrives with a train of pink streamers and obnoxious piñatas shaped like babies trailing behind her. You get a text from the caterer that he will be late. The final straw is when the mother-in-law proudly pulls out the “dirty diaper game”. You feel like you are about to explode. This is NOT the vision you had and not what your friend wants. You have two choices. You can dig your heels in, blow up at the hotel staff and caterer and refuse to let the mother-in-law put up her decorations. Your overly pregnant friend will arrive to a chaotic mess, but you will show her your vision. Or…. there is another way. 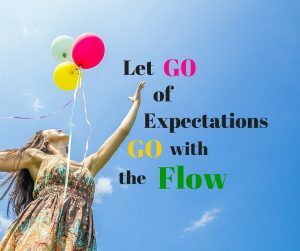 Release your expectations and go with the flow. In the Zen tradition there is a concept called shoshin, or “beginner’s mind”. It suggests that we should arrive at every situation with an empty cup, ready to receive. If our cup is full, then we have no place to put what is coming to us. By showing up with an empty cup, we release our expectation of how things “should” be, allowing us to see what is. This helps us to also remove our tendency to interject our ego into a situation, which often results in trying to control. We hear this all the time, but, it’s no less true. We only have this now moment. The past is done and cannot be changed and the future hasn’t happened and cannot be accurately predicted. In this context if we hold on to an expectation, we are not connected to what’s happening around us. Walking in with a full cup and a “knowing” of how a situation should play out, we are not present in the moment. We are present in our past and the future. By relinquishing control, we are open to the newness of the experience. Children live in the moment. Up to a certain age, they go through their days excited for what will happen next. Beyond this however, when we view the people we interact with as the perfect, innocent child they are, it is easier to see their “adult” behavior that may be less than ideal for what it is; programming, usually received from an authority figure during childhood that tarnishes in some way that perfection by telling them they aren’t good enough. So how can the friend in our example use these techniques? First, she must let go of how she thought the day would go and assess the actual current situation. She must shed her ego of planning the perfect day and go with what is. By arriving at the venue with an empty cup, she will have the room to see things differently. For instance, several children will be coming to the shower and she wasn’t sure what to do with them at her classy event. Now that the party is right next to the pool, she quickly posts on Facebook to “bring your suits – there is swimming!” Problem solved. The caterer estimates she will be 30 minutes late. Because of the mix-up with the room, the hotel offers complimentary drinks and hors d’oeuvres as well as a 20% reduction in the rental fee. Finally, the mother-in-law. By taking a deep breath and seeing her as a child, it’s easier to see that she just wants to help. This is her first grandchild and she is excited. It’s true that she doesn’t understand your friend’s taste, but she means well and is proud of her decorations. So, the decorations go up and the classic “find the dirty diaper” game will commence. Your friend arrives. You are cool, calm and collected. You brief her on what is going on, but people are happy, the children are swimming and not underfoot and the mimosas are plentiful. The two of you chuckle over the decorations and games, but it’s your energy, your demeanor that sets the tone and your friend laughs it off. The day is saved and the party turns out to be a hit.